Why I read this book: Why I read this book now is probably a better question (I'd been meaning to for some time): I'd heard about the series coming out in July and after seeing the awesome trailer I decided I really needed to read this before watching the series (I have this rule about that..). This book scared me to begin with, the sheer size of it (mine has 1076 pages) and the whole idea that it centers around a church, since I'm not exactly religious. But let me start of by saying The Pillars of the Earth is so much more! I tried to write a summary of this story, but it's so complex and has so many separate storylines at first, which come together in the end, that it's nearly impossible without giving away the whole plot. The story centers around Tom Builder and his family and the priory of Kingsbridge with prior Philip as the other main character. After the cathedral in Kingsbridge burns down, Tom is hired as master-builder to build a new one. The rivalry between Alfred, his son, and Jack, the son of his second wife Ellen, doesn't make family life any easier. Prior Philip, taken in by monks after his parents were killed when he was 6 years old, struggles against the rigidity of the older monks, the malice of the bishop of Kingsbridge and William of Hamleigh, a nobleman's son, determined to destroy Kingsbridge. Against the backdrop of the building of the cathedral and the civil war in 12th century England, the story is set that contains family, love, loyalty, malevolence, treachery, greed and of course religion. I really loved the pacing, I thought it would be slow, which happens a lot with bigger books, but it turned out to be a really fast read. 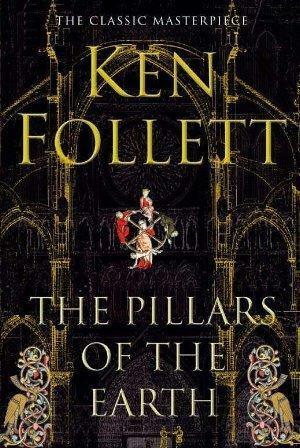 Follett introduces you to the characters and then builds his story around this. You're thrown right into the action from the start. Some of the characters have become especially dear to me, most of all Prior Philip and Jack. Of course there are the characters who oppose them and I always appreciate them not being evil for the sake of evil, but we are given reasons for the way they act. To me it shows the skill of the author that I can really hate one of the characters, William Hamleigh, he made me care enough to. Follett doesn't shy away from physical violence, including sexual abuse, which made me gasp in horror at the things people are capable of, but without it, the book probably wouldn't have been realistic. And although it centers around a priory, there's no preaching, which probably has to do with the author himself not being a christian. I believed Philip in his religious moments of doubt and in his devotion to God. All in all, this is such an epic tale of everything about human life, with lovable and strong characters and it completely blew me away. If I wasn't so busy, I probably would have read this without putting it down, it was that good (I swear I heard hallelujah sounds while reading it). I give this book 5+ stars because it is a new favourite and I'm adding the sequel World Without End to my to-read list. I've been wanting to read this as well. The series coming out also has me interested. Though it's quite the tome. Not sure I'm ready to tackle something that long! What country is the series coming out in? I bought this book on sale at a festival this past weekend because my mother was reading it. I'm a little wary of sexual violence so it might be difficult to finish. I trust the judgement from any members of this blog. Thanks! This was probably one of the best books I have ever read! I LOVED this book! I thought about reviewing it for this blog, but I wouldn't have been able to put all my thoughts together. You did a great job! This is one of my favorite books ever. Glad to hear you enjoyed it too. This book was so amazing! I agree that it's hard to encapsulate into one statement. To me, it just felt like a good, solid piece of fiction. It's a book club selection for my local book group...I was dreading it a little because of the length, but now I'm all excited to read it. Thanks for sharing your review! Sam - on the website it said USA, but I don't know what other countries it's airing in. AliBird - I haven't read World Without End yet, but I'm definitely going to! BookwormMeetsBookworm - I thought Follett handled the sexual abuse well, but you'll have to let me know what you think once you've read it. I've had this book on my shelf for ages. Its length is really putting me off at the moment, but I keep seeing wonderful reviews like this and so I know I should get it out. Hopefully I'll love it as much as you did.